Sunday is a day of rest, and spend time with the family. Nothing like sitting at the table with family with a great meal and talking. And giving thanks. Growing up, my mom almost always had friends over for Sunday dinner. A lot of the times we would have pork or ham, along with mashed potatoes, corn, green beans and bread, we would also have dessert. If the weather was good we would eat outside, which I always enjoyed. We'd sit at the the table and pass around the food, so we could serve ourself. My mom was a great cook. I miss my moms cooking. I am so thankful for all the wonderful meals my mom cooked, and thankful for all her recipes and cookbooks. Great memories! Growing up, what was some of your Sunday dinners? What was your favorite meal on Sunday? I love sharing memories with folks. I would love to hear from you, so leave me a comment. Preheat oven to 375 degrees. Line a rimmed baking sheet with heavy duty aluminum foil. Lightly grease foil. In shallow dish combine peppercorn and salt. In a separate shallow dish, lightly beat the eggs. Dip the tenderloins in the egg to coat. Dredge them in the peppercorn, completely covering the tenderloins. Arrange them on the prepared baking sheet, and bake until an instant read thermometer inserted into the thickest portion register 155 degrees, about 18 to 20 minutes. Remove the tenderloins from the oven to a cutting board and let rest for 10 minutes. Cut into 1/4 inch slices. Enjoy! Looks amazing. We had pork loin last week with a sun-dried tomato rub. Good stuff! We normally had chicken. In the summer my mom would grill hamburgers and hot dogs. It was something different every Sunday. Thanks for sharing! In the winter we would have venison. Summer, we would have chicken or hamburgers. My mom cooked, pasta, stews, soups for Sunday dinner. 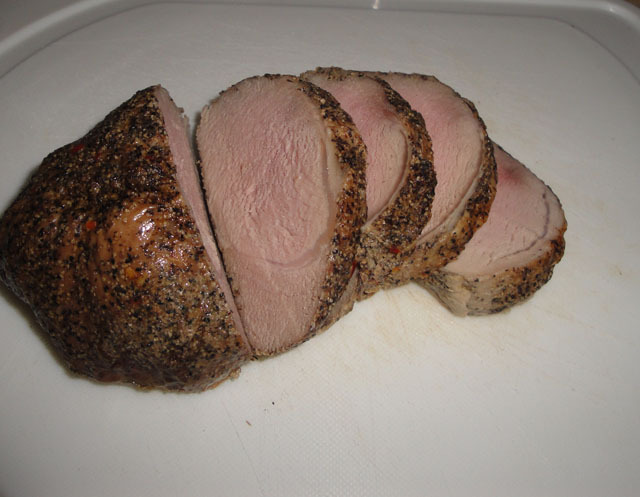 Food Frenzy, sun dried tomato rub on pork loin sounds good. Thanks for your comment. This looks great! On Sundays my dad would pick up random things from the store and always turn it into something amazing. He is a great cook, and it was really special watching/helping him on the one day a week he had time. Thanks for the Foodbuzz add! Mike, Enjoy your meal tonight. Thanks!